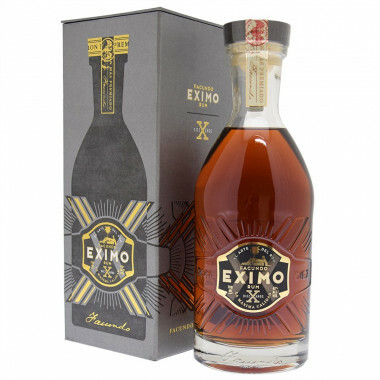 Facundo Eximo is a unique rum that has been blended before aging. Bacardí relied on his Ron Maestro to achieve this successful and original experience. Facundo Eximo rum has a unique style with its assembling made before aging. This original process is the work realised by Bacardí's Maestro of Ron (rum master blender) who has used his know-how to create an extraordinarily balanced blend with rich aromas and flavours, before allowing the blend of rums to age for a minimum of ten years in oak barrels. It is this freedom to liberate itself from traditional codes that gave its name to the rum Facundo Eximo, a rum freed from the idea that assembling has to be done after aging. The rum that makes up this luxurious blend has benefited from its maturation in barrels for a minimum of 10 years. Nose: characterised by notes of toffee, caramel and walnuts. Palate: soft with deep notes of vanilla and cocoa with a hint of smoke. The texture is round and full.